Second, this event took place because someone hacked the AP twitter feed (according to the Wall Street journal “a group of enthusiastic Syrian youths” have claimed responsibility). It’s difficult to imagine anyone hacking the front page of the NY Times or brainwashing Walter Cronkite. 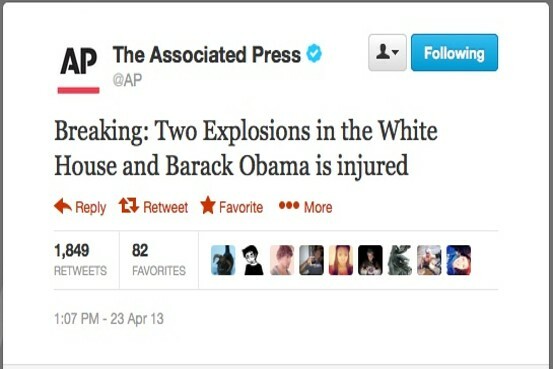 Moreover, while hacking the AP account certainly enhanced the number of followers who saw the tweet and enhanced it’s credibility, it is not difficult to imagine this sort of “hoax” spreading quickly from a home grown Twitter account either, especially given the fact that plenty of people access Tweets via #hashtags (keywords) in addition to simply following others. At its core, social media continue to be differentiated from traditional media by the fact that anyone can send a message. How many people will listed to that message will of course vary, but send the right message in the right circumstances that looks the right way, and you can knock $200 billion out of the US economy in a heartbeat.